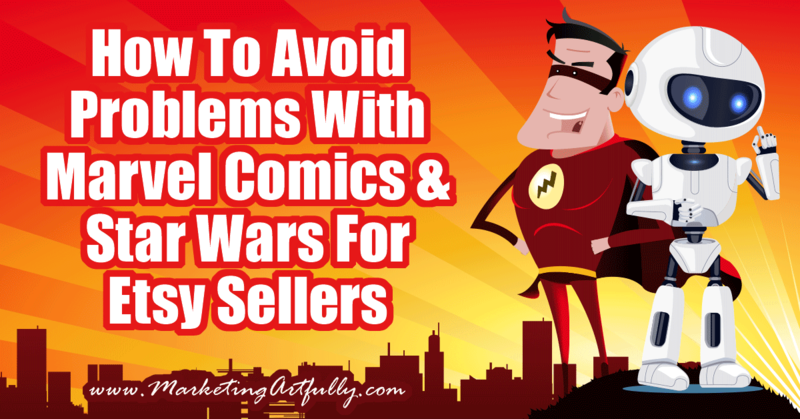 If you are an Etsy seller and want to avoid getting your shop shut down, you need to know the “rules” of using Marvel Comics and Star Wars characters in your products. This post will break down things to be aware of, what you can and can’t do and how to use your titles and tags to get found for these types of products. Disclaimer… I am a marketing person, not a lawyer. Please do not take my word for this, if you have a question, research it yourself or retain legal counsel. In my post about avoiding problems with Disney characters I talked a lot about “public domain” and the fact that many of Disney’s stories are based on fairy tales that were written years ago (sometimes centuries ago) and which had fallen out of copyright and into the public domain. Almost NONE of the Star Wars or Marvel Comics characters will fall into this category. 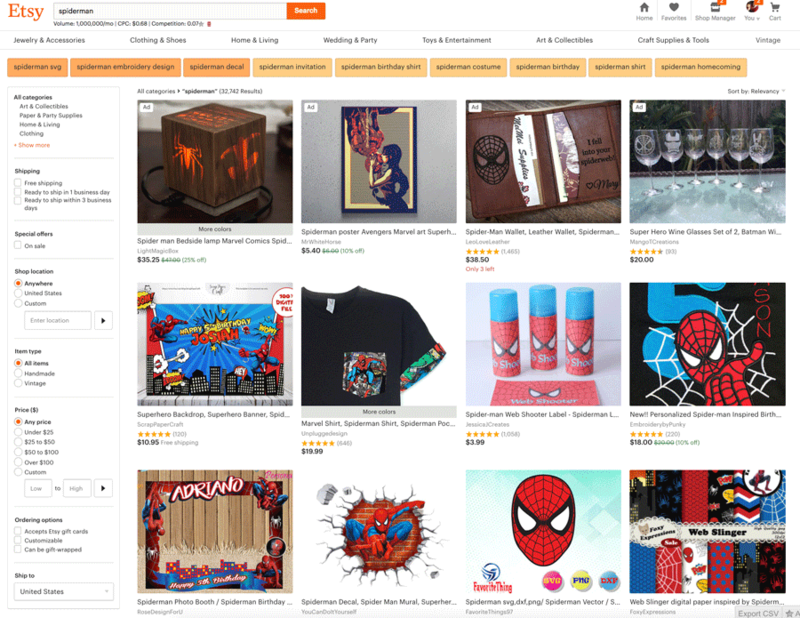 Most are currently “owned” by Disney which guards it’s trademarks rigorously and could for sure cause problems if you get a cease and desist or trademark infringement through Etsy. That said, MANY shops are using these characters currently which can be very frustrating. Why are they able to make products and you can’t? Some, like the black tshirt, have a chance of avoiding problems by using “First Sale Doctrine” (meaning that buying a branded fabric or licensed product and modifying it is the “first sale” and you SHOULD have the right to use it to make products to sell). That said, Etsy will not take the time to research all of this and you probably don’t have deep enough pockets to fight Disney if they contact Etsy about your shop. As you can see at the top, Etsy has even sorted these products into different kinds of products likes SVGs, invitations and birthday. WHY would Etsy not just take these products down? Because it is Disney’s responsibility to report violations, Etsy is just a conduit to selling products. 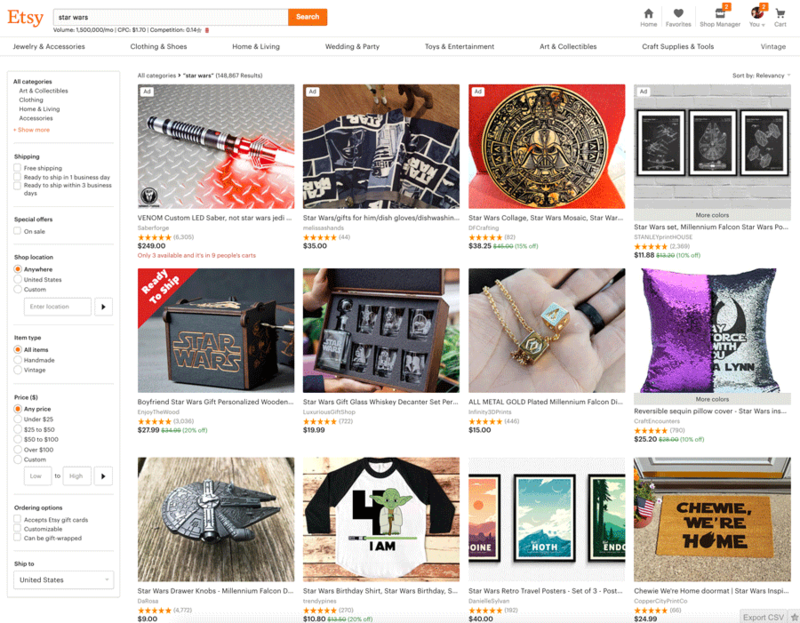 If Disney reports that a shop has violated Copyright or Trademark then Etsy will remove the item and notify the shop owner. On the Etsy Facebook groups I follow I often find that Etsy sellers passionately trying to defend their use of trademarked materials by saying that they are making products that are “inspired by” Star Wars or other notable properties. For example, those vintage travel posters ARE inspired by Star Wars in that there were never travel posters made in the films or books. BUT no one would know about those places unless they were created by George Lucas in the first place. 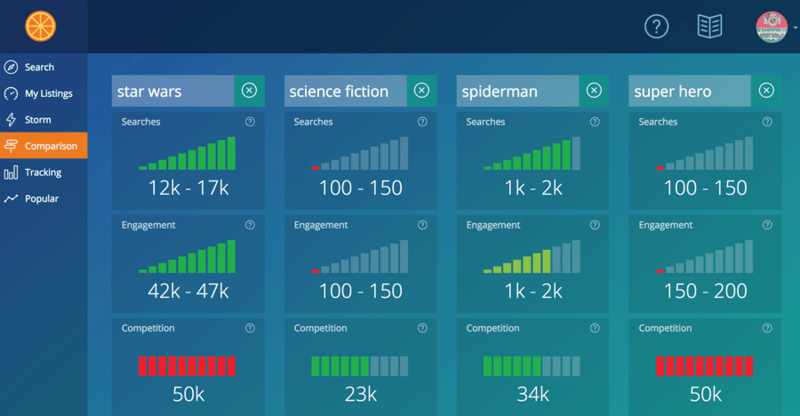 Additionally they would not be found without using Star Wars in the title or tags because the search volume for “hoth” is probably pretty darn low! Marvel Comics has 274 copyrights such as the titles of the specific comic books, movies, and even coloring books and crayons. Star Wars has 3,805 copyrights which include the movies, CDs, popup books and even the musical scores in the movies. That means that trademarks can be “live” or “dead” when you do a trademark search. If it is a dead trademark that kind of product is no longer protected. Trademarks also have “classes” that cover what types of products they are protecting. For example Class 25 covers “Clothing, footwear, headgear.” so if a company doesn’t have a trademark in that class on those types of items, you COULD use a common term for making products in that “class”. This is why you will sometimes see weird things called “Christmas Decorations” even though they are not really Christmassy because that is not a protected class. That said, even though something might not be in a trademarked class, it could still be protected by copyright. I was looking at trademarks for a client the other day who has a Darth Vadar themed candle. Because I am not “legal-y” I asked a paralegal friend, Suzanne Olden, for some help with understanding if they are violating trademark. Darth Vader isn’t trademarked “for candles” but it’s a bit more complicated than that. For this we need to go back to classes. There are a lot of them and they are numbered. The USPTO has a lot of classifications. Some are for goods, some are for services. The entire manual of classes can be found here http://tess2.uspto.gov/netahtml/manual.html, but it’s easier to search the online manual here http://tess2.uspto.gov/netahtml/tidm.html. So let’s check candles, which would be most easily searched by using the first dropdown and choosing description, then typing in “candle” in the next field. The results show that candles as part of a goods description fall in class 004, 005, 011, 013, 021, 028 and 035. Now look at the descriptive words in the search results and find what is most like what you want to file, in this case scented candles which falls in class 004. 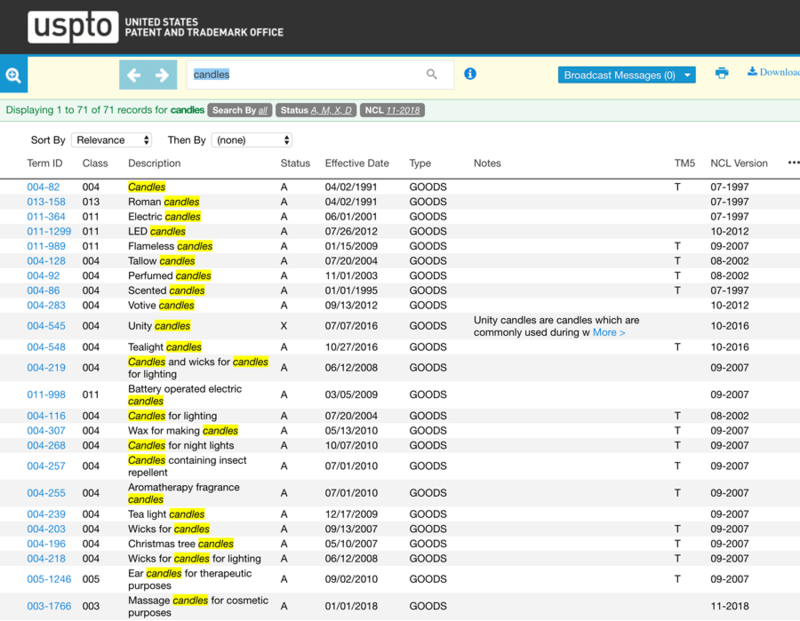 Now here’s why it’s important to know what class your mark falls in… when searching a mark at the USPTO (which you can do here https://www.uspto.gov/trademarks-application-process/search-trademark-database) you would put your search term in the field, make the next dropdown “ALL” and see what pops up. The “Darth Vader” search returns 17 records. If you check each record (live ones, only, dead marks have expired or been cancelled and are fair game) The second section “Goods and Services” has a bunch of numbers listed, along with some descriptions. If you would see 004 listed, then you have an uphill battle in getting your mark registered, and if you are using something very similar, you should probably STOP as it could be infringing. If any of the other classes show up, read the description of the product/service very carefully. It will help you decide if there are issues in the other classes as well. 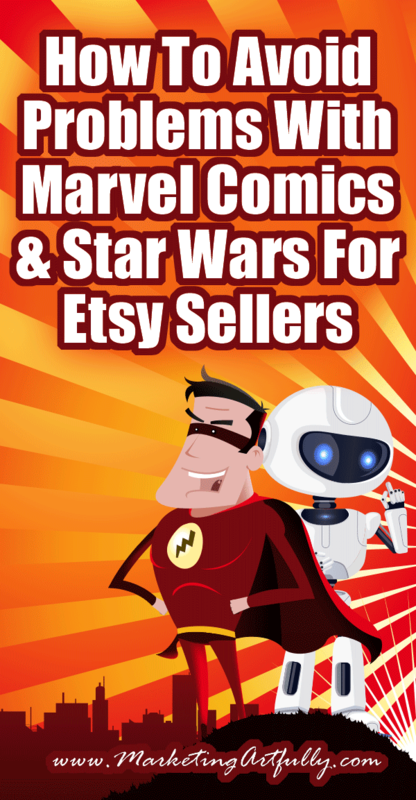 Doing research for this post I have to say that as an Etsy seller I can’t recommend using ANYTHING from Marvel and Star Wars. That said, there are degrees of violating the “rules”. If you are trying to still get to use recognizable items then at least be smart about it! Thor is a Norse god of mythology (as is Loki.. my favorite!) So you have every right to make Thor products using that name. BUT, you do not have the right to give him a red cape and black outfit. And Loki’s distinctive large green “horns” are off the table too. 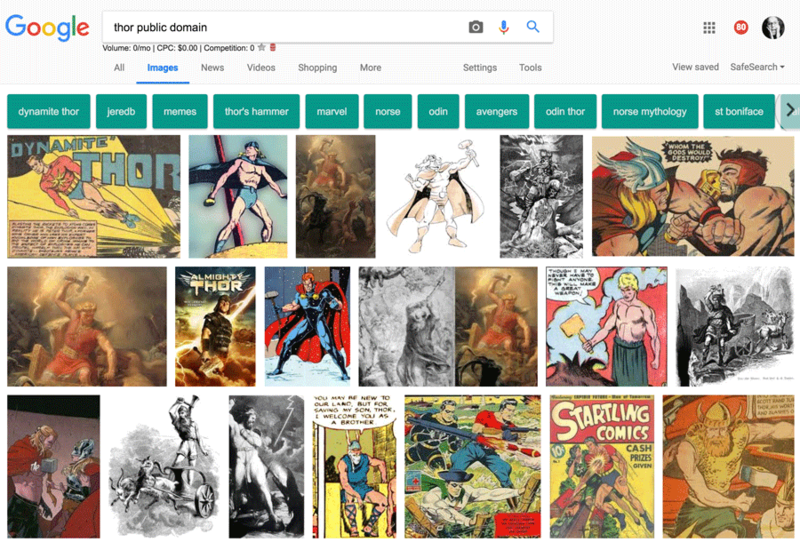 These images of Thor are in the public domain and could be used as a basis for developing products! Just remember, while that will cover you for the type of product you are making it might not cover you for the overarching Copyright of that specific character or brand. 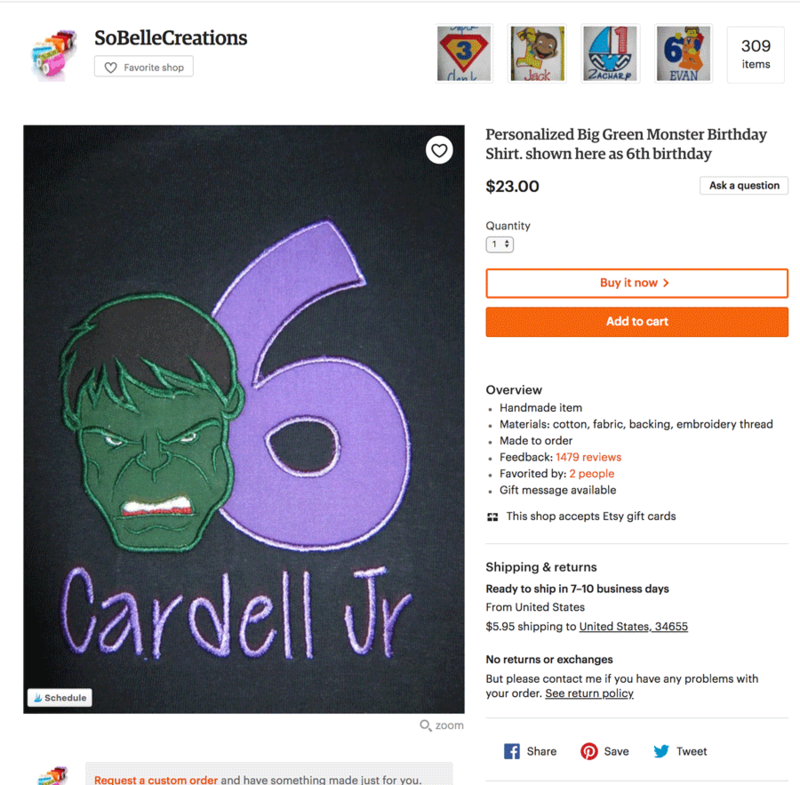 I found this tshirt that talks about the “big green monster shirt” instead of the Incredible Hulk. While the design could be “iffy” her title would not draw the immediate attention of the trademark police. Another way you can make it less obvious that you are using someone else’s IP (intellectual property) is to skip using “Star Wars” in the title and just list it in your tags. Instead of using “spiderman” say “spider super hero”. Instead of “star wars” say “science fiction”. I KNOW, there are so many less searches for those terms than for the “real” ones. That is because Marvel and George Lucas have spent their lifetimes building up recognizable characters. Just because they are popular doesn’t give us the right to infringe on their work. All of this is very helpful, but another thing to keep in mind is that Disney, who now own Lucasfilms and Marvel, are insanely protective of their IP. They have to be so you may want to think very carefully about using names or images that are so close you’ll end up in trouble. I did a blog post where I talked about copyrights for Disney (before I knew I could pick Suzanne’s paralegal brain) and it was mostly right. (a) In General.—Copyright in a work created on or after January 1, 1978, subsists from its creation and, except as provided by the following subsections, endures for a term consisting of the life of the author and 70 years after the author’s death. (b) Joint Works.—In the case of a joint work prepared by two or more authors who did not work for hire, the copyright endures for a term consisting of the life of the last surviving author and 70 years after such last surviving author’s death. What this all really means is that if a PERSON wrote the work being copyrighted, it is 70 years. However, if a corporate entity or anonymous or pseudonymous (pen name) author wrote the work, the copyright is either 95 years from the date it was first published, or 120 years from the date it was created. There is a difference in published and created. Say you wrote a book in 1998, but didn’t publish it until 2018, your copyright would run 95 years from 2018 (the year 2123) or 120 years from 1998 (the year 2118). Since the creation date expires first, it would expire in 2118. Ok, so back to what you can use. Marvel comics and Star Wars are both original works that have been copyrighted. From Suzanne’s experience at her employment, when they decide not to Trademark something, theye often do so because the picture or logo is found in works that are Copyright protected. So say you want to use the name “Wonder Woman Power” as a candle scent; it would probably end up getting you in trouble. Doing this post I found a lot of fun resources about trademark and these two properties. Seeing as how I am marketing person not a legal eagle, I thought I would share them with you! Avoid the Dark Side of Trademark Infringement – Know Your Star Wars Trademarks – I thought this one was good as it pointed out some of the info about particular “classes” of products protected by trademarks. A Handy List of Star Wars References that Might Get You Sued – Includes some additional terms that are protected which you might not have thought of! Copyright in Characters: What Can I Use? – Good examples of how to use characters that are similar to recognizable characters without crossing the line. Superheroes That Marvel Does Not Own the Rights to Anymore – Not all that helpful to us but may signify super heroes that might not be as rigorously defended.